I really liked this book. But one sentence alone isn't likely to read as a really great review, is it? Hmm. 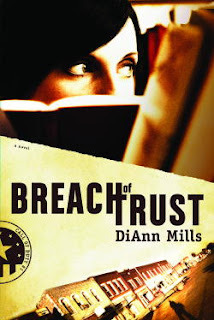 Breach of Trust by DiAnn Mills is a new release from Tyndale House Publishers. It is the story of Paige Rogers, a small town librarian. Or is she? Paige is a former CIA operative that is in quasi hiding. Her past begins to haunt her and the things she has worked to keep hidden about past CIA operations are starting to leak out and effect her small town life. The formula for the story is somewhat predictable, however, author Diann Mills did manage to pull a few surprises. Mills style of writing is to throw facts at your like a punch in the gut. The story is moving along and then all of the sudden you are hit with a new set of facts which change the circumstances of everything. What you think is predictable suddenly isn't. Instead of gradually unfolding the story though and letting you tie together facts and get your conclusions at the end of the book, she feeds them to you in small doses. It's an interesting style of writing and a bit different than what I've come across in the past. The one thing I find interesting, and I'm not sure why the trend, is that the hero of the book is a female. The same thing kinda bothered me about The Negotiator . It's a I'm-a-Tough-Girl-Power-type-book-who-still-needs-a-strong-man-to-fall-in-love-with. I confess I don't get it. The love interest in the book is a strong male, fully capable of taking care of Paige and being a, well, manly man. But the girl in the story has the most struggles and problems and is the one with the gun, the one diffusing bombs and generally bringing order to the chaos. It's a trend in story telling that I don't quite understand the point of. I had to lay these thoughts aside in order to enjoy the story - which I successfully did. It's just a nagging thought in the back of my head. Why? I read Breach of Trust for my church bookclub. It's kind of an interesting pick, but I honestly enjoyed it and will plan on reading the second book in this series, Breach of Security, which is due out in the Spring of 2010. (I'll be waiting a little while.) I'm curious to see where Mills goes with the story line and the characters are interesting enough to me to make me want to find out what happens to them -- even if it does mean a sleepless night or two! This book WAS fun and, again, provided you like a bit of suspense, I bet you'll find it fun too. I have this book in my basket of pending reads, too. Hmm, does sound interesting. I have to take suspense novels in moderation though...especially since I primarily read them before bed! I'll have to keep an eye out for book 2 as well. I enjoyed this one, too, and just passed it on to my sister! I wasn't a huge fan of this, I thought it dragged a little bit. But I am a huge fan of the powerful heroine! I guess I don't understand why you don't like that.